Donald Trump blames the Obama Admin for fostering the rise of the Islamic State, and suggests he could have all but predicted the burning of Saudi Arabia’s Embassy in Tehran Saturday. “I’m pretty good at signals, and I see a lot of things happening,” Donald Trump said, referring to unrest sparked by the execution in Saudi Arabia of a prominent Shiite cleric. 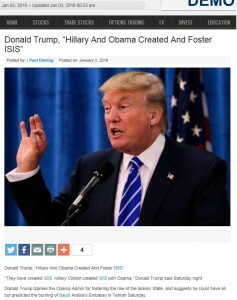 And he noted he’d previously called for bombing the Oil assets of ISIS. Global Million Mask Marches Nov.5th.